Originally created for the James Gallery, The Graduate Center, The City University of New York. Yunhee Min explores the impact of color and geometry on spatial perception in her vibrantly hued paintings and sculptures. Drawing on influences as varied as color theory, minimalism, the history of abstract painting, and architecture, Min creates immersive spaces that energize their surroundings. 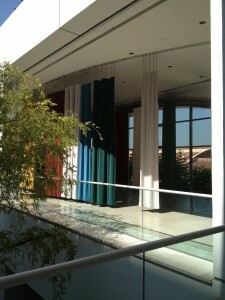 Originally conceived for and installed at the James Gallery at the City University of New York, For Instance was generously donated to the Hammer Museum by the university. Expanded and reconfigured for the Hammer’s Lindbrook Terrace, the work consists of drapes fabricated in various widths in a surprisingly serene palette of steely blue, muted red, warm tallow, and bright white. Designed to allow for open spaces between the panels, the curtains create planes of color that can be reconfigured into alternative groupings. The work serves as both a large-scale sculpture and a functional element that can be used to delineate space or block natural light during special events.